He challenged ‘The Boss’ in the ice floes of Antarctica. Now again, alone and destitute in the middle of a still night, he challenges him one last time. Shackleton's Endurance sank in Antarctica, leaving him and his crew of 27 stranded. Harry McNish, Shackleton’s Carpenter and brilliant shipwright, challenged The Boss, but went all the way with him, ensuring all lives were saved after a journey universally agreed to be the most astonishing voyage of survival in history. For all his bravery and ingenuity, McNish was one of very few who never received the Polar Medal. What was it that caused this man to antagonise the hero of Antarctica? How does he come to terms with it. 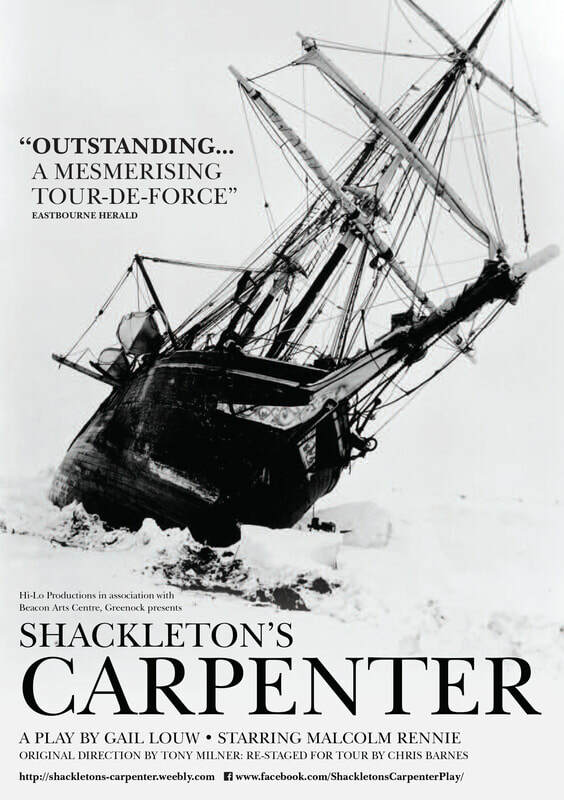 'Shackleton's Carpenter' is a one man play about Harry McNish, carpenter and shipwright, who was on the ill-fated Endurance voyage to the Antarctic with Shackleton and 26 other crew and scientists in 1914. The voyage is iconic for the sufferings of the men, the photography of the expedition, and its outcome. After 16 months stranded in the middle of ice floes, and journeys on lifeboats through treacherous seas, all 28 lives were saved. Shackleton is a byword for leadership and motivational skills. The play focuses on the carpenter, a dour religious man who challenged Shackleton during this period. The carpenter was instrumental in enabling Shackleton and five others (including himself) to sail the famous James Caird lifeboat from Elephant Island to South Georgia, a journey of 800 miles in the worst seas known, and save the crew. However, he was one of four who did not receive the polar medal. Many still campaign to this day to have this omission righted. 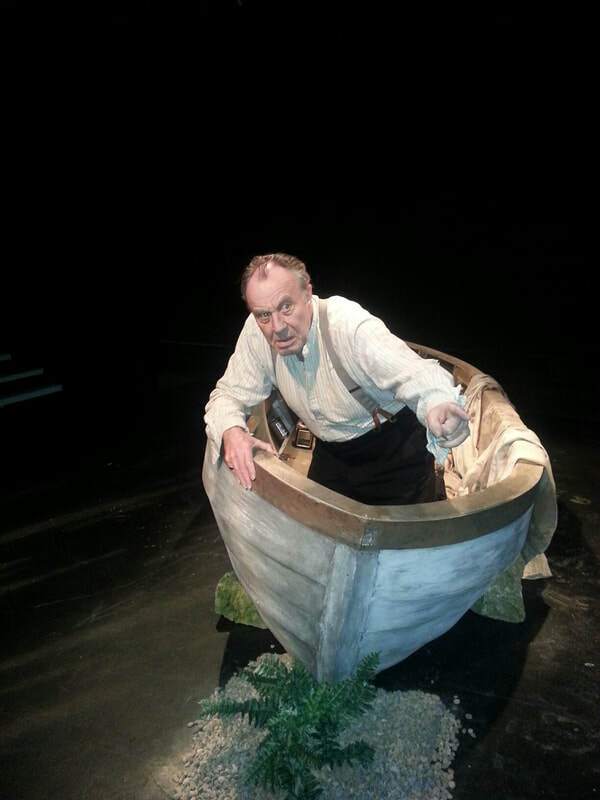 The play opens in 1930 with the carpenter destitute, physically and mentally broken, sleeping in an open boat on the wharf in New Zealand. He wakes in the middle of the night and speaks of his time, his experiences and loved ones, and conjures up the ghosts of his past, principally Shackleton. The play explores issues of status and the class system, all relevant today. The play coincides with the centenary of Shackleton's journey. The play runs for 1 hour 30minutes. Malcolm Rennie has appeared in over 20 West End shows including Catch my Soul, She Stoops to Conquer, The Good Companions, Salad Days, The Price, The Cabinet Minister and many more. Recent stage appearances include Sir Anthony Absolute in The Rivals (Salisbury), Salieri in Amadeus (York), Willy Clark in The Sunshine Boys (W Yorks) and Col Pickering in My Fair Lady on international tour. Many TV and Film appearances including Midsomer Murders, Taggart, Ransom, Pride & Prejudice, The Lenny Henry Show, Sunny Stories, The Accountant, Monarch of the Glen and most recently Hysteria, Coronation Street, Sherlock and 3 series of Mr Selfridge as Fraser the family butler. Louw’s writing is outstanding. Rennie’s performance is a mesmerising tour-de-force of unparalleled intensity. (Eastbourne Herald). At the end, the Old Market audience gave thunderous applause for what had been a very powerful production of a clever, elegantly constructed play. Getting one character to create several others on stage is no easy task, but Louw’s writing and Rennie’s performance made the illusion really believable. Gail Louw, a Brighton based playwright, and New Vic Productions have produced a number of new plays; Joe Ho Ho and Two Sisters at the Brighton Pavilion, Killing Faith at the Devonshire Park Theatre in Eastbourne and Blonde Poison which has toured nationally to great acclaim. Blonde Poison won an Argus Award for Artistic Excellence at the Brighton Festival in 2012. ‘Blonde Poison’ was on at Theatre40, Beverly Hills USA in January/February 2015, Salem, Oregon in February/March 2015 and Sydney in August/September 2015. Her play ‘Duwayne’ won Best New Play at Brighton Festival 2014. ‘Shackleton’s Carpenter’ was on tour in November 2014 through to February 2015. Her play, ‘and this is Mr Laurel’ with Jeffrey Holland played the Edinburgh Fringe in 2014 and 2015, and had a 26 venue tour in autumn 2015. ‘Miss Dietrich Regrets’ toured the UK in 2015, and was on in Johannesburg, South Africa in June. Her play ‘Two Sisters’ is on at Theatre40 Los Angeles in Jan/Feb 2016, and Blonde Poison plays at the Sydney Opera House (studio) in April May 2016 and the Lawler Theatre Melbourne May/June. ​Tony Milner had a long career in the theatre as an actor, director and producer with the New Vic. He produced numerous Number 1 tours as well as West End/Broadway shows. Recent work as a director has been with Gail Louw’s writing; Killing Faith, Joe Ho Ho, and Blonde Poison.